Yes - it's true! You can hold amazing power over your life and over the life of others! HERE IS MAGICKAL INFORMATION NEVER BEFORE REVEALED! Strange but true: the common mirror - any normal mirror - can become a potent tool of occult power when Magickally charged! Through it YOU CAN MAGICKALLY ASTRAL PROJECT! Through it YOU CAN DISCOVER THE SECRET ACTIONS OF OTHERS! Through it YOU CAN DISCOVER THE PLANS OF OTHERS! Through it YOU CAN SEE WINNING NUMBERS, HORSES, DOGS etc! Through it YOU CAN MAKE ANOTHER PERSON DO YOUR BIDDING! Through it YOU CAN DEFEAT AND PUNISH ENEMIES! Through it YOU CAN DRAMATICALLY IMPROVE YOUR HEALTH AND THE HEALTH OF OTHERS! Through it YOU CAN FIND SECRET INFORMATION THAT COULD MAKE YOU RICH! Through it YOU CAN SEE INTO THE FUTURE! Through it YOU CAN AVOID HARM, INJURY, AND OTHER MISFORTUNE! Through it YOU CAN HAVE MONEY COMING TO YOU IN NO TIME! This is not fiction! Ever since the time of the ancient Egyptians the mirror has been used as a magickal device for making the seemingly impossible happen! A woman found that her husband was cheating by looking into her magickal mirror! She later wrote to the author that the mirror also helped her stop his infidelity and made their marriage good again. Her husband since has eyes for no-one but her! Another man wrote that he was appalled to discover what his family was plotting. And it was also through the magick mirror that he was able to thwart their plans and turn the tables on them. Travelling out of your body can at last become a reality for you! This remarkable phenomenon is possible through Mirror Magick. You can invisibly travel anywhere... through walls... into apartments... anywhere in the world, AND SEE AND HEAR WHAT OTHERS ARE DOING WITHOUT THEIR KNOWLEDGE! Never before has such information about the magickal uses of the mirror been made public! You will be astounded at the secret power it can give you, and because you invoke only good powers you are safe! A mother wrote to the author saying how distressed she had been by the young woman her son was seeing. She knew she was no good for him, yet he was besotted with her! The girlfriend was dumbfounded by his sudden change of heart! Another man claimed he saw winning numbers in his mirror! he won £55,000! A Young woman just couldn't get the man she wanted to take an interest in her. Mirror Magick suddenly made him want to see her! A father was concerned about his son's worsening drug habit. HE WAS ABLE TO DIRECTLY INFLUENCE HIS SON'S BEHAVIOUR THROUGH THE MAGICK MIRROR! Ten weeks later his son had kicked the habit for good! A young woman was bothered by a severe skin condition which would not respond to treatment. Dermatologists told her she would just have to live with it. Not so, after she tried Mirror Magick. Within five weeks her skin was perfectly clear! THROUGH MIRROR MAGICK MANY HEALTH ISSUES CAN BE TREATED. From time immemorial magicians have used mirrors to affect their purpose. You can now do the same. 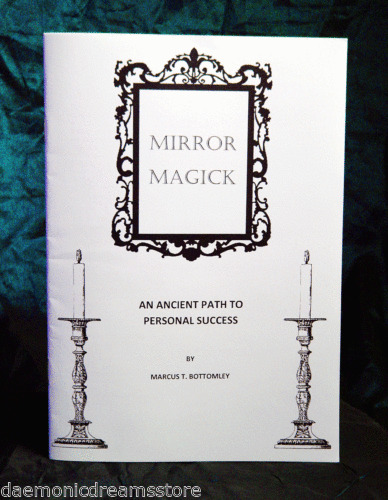 This book shows how you can take any mirror and make it into a powerful magickal device for accomplishing your desires.